I am bitterly disappointed by Paul Ryan. Brilliant and gifted, he has gone to the dark Progressive side of politics. If he is wondering, as his new book is entitled, “Where Do We Go From Here?” Well, at this rate, straight to hell Paul. Shame on you. While Americans are distracted once again by a government shut down and while they are valiantly fighting off Obama while he tries to force himself on America collectively with Obamacare, Paul Ryan has been quietly working away at passing Amnesty for millions of illegal immigrants. Ensuring a permanent Progressive stranglehold on America. To Paul Ryan: may your chains set lightly upon you, and may posterity forget that you were our countrymen. You have betrayed the Constitution, Conservatives and America as a whole. But as much as Democrats — and Republicans — seem to enjoy criticizing Cruz, the Texas senator has raised his profile with the CR and Obamacare issue, perhaps fueling his presidential prospects. For Ryan, who is also rumored to be in the running for 2016, the calculus might be exactly the opposite. By seemingly staying out of the fight, Ryan avoids the blowback if the government shut downs, if Obamacare is not defunded and if Congress fails to raise the debt limit. For Ryan, name recognition is no problem, and he has always aimed to attract mainstream conservatives, many of whom believe the effort to defund Obamacare is a folly. Staying silent and keeping off camera allows Ryan to let Congress work its will — and if it really came to it, perhaps he could step in as a fresh voice in the Republican Conference to urge his colleagues to keep the government and the global financial market running. And Ryan may have calculated that his voice is better heard behind closed doors for now. 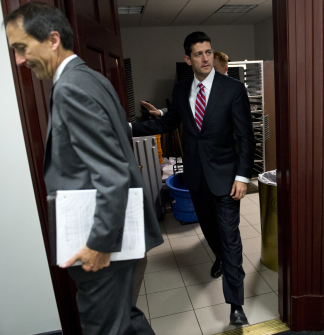 While Ted Cruz is proving his true Tea Party principles, Ryan is doing the opposite. Faux Tea Party wannabes like Ryan and Rubio are coming across as opportunistic with colors that run with the political downpour. We are not fooled and we are watching. The Progressives on the right side of aisle want Obamacare and Amnesty as much as the left. It is the destruction of America, our freedoms and way of life they seek for their own benefit. They attempt to wrap themselves in Tea Party flags and cloak themselves under a Christian fog, but what they are doing and putting forth is nothing less than Marxist evil. Speaker John Boehner, R-Ohio, and other members of the House Republican leadership also support a resolution to an issue that has become a political drag for their party. Keep your eyes on Amnesty as well folks. Obamacare and Amnesty are the one-two knock out punches for America and despite lip service, Progressives on both sides are industriously pushing these agendas. The halls of Congress are turning into the Killing Fields of America. Where do we go from here? A political earthquake over the next three years. Bring on the tea baby.